KIEV, Ukraine -- Prime Minister Stephen Harper is being accused of exaggerating this week the extent of the 1932-33 famine that was declared a genocide by Canada's Parliament two years ago. President of the Ukraine Viktor Yanukovych (L) and Prime Minister of Canada Stephen Harper walk in front of their national flags prior to a joint press-conference following talks in Kiev on October 25, 2010. Harper indicated on both days of his first-ever journey to Ukraine that "almost" 10 million people died in what is known as the Holodomor — or "death by starvation." Critics, while stressing that the death toll of the famine caused by Soviet dictator Josef Stalin's policies is massive and remains one of history's great crimes against humanity, said the true figure is roughly a third of Harper's. "I find it regrettable that Stephen Harper and other leading Western politicians are continuing to use such exaggerated figures for Ukrainian famine mortality," University of Melbourne historian and demographer Stephen Wheatcroft told Postmedia News in an email. "There is absolutely no basis for accepting a figure of 10 million Ukrainians dying as a result of the famine of 1932-33. No reputable demographer accepts this," stated Wheatcroft, who puts the figure at around 3.5 million. "None of the Ukrainian, Russian or Western historians, who are experts in this area, who have looked at the detailed evidence and have an ability to understand numbers, would support such a figure." Harper spokesman Dimitri Soudas said Friday "nobody" can be sure how many died. "To minimize this act of genocide by claiming exaggeration is quite sad because there are a number of published estimates," Soudas wrote in an email. 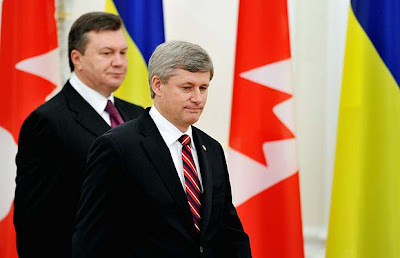 Harper made two references to the famine while in Ukraine. "Some 10 million people, up to 10 million people, and we'll never know the numbers for sure, (were) killed, and killed through the deliberate plans of their own government," he said at the joint news conference in the capital city of Kyiv while sitting next to President Viktor Yanukovych. On Tuesday, Harper raised it again while speaking to students at a small Catholic university in Lviv, in Ukraine's nationalist heartland. "Now as you know almost as many — or you may know — almost as many Ukrainians died in the Holodomor during the 1930s as there were Canadians alive at that time," he told them. During the time of the famine there were approximately 10.6 million Canadians, according to Statistics Canada. Ukrainian Canadian Congress president Paul Grod sent out a statement after Tuesday's event that actually exaggerated Harper's claim. "Harper emphasized the genocidal nature of the Holodomor and commented that more people were killed during that horror than were alive in Canada at that time," Grod wrote. Grod referred Postmedia News to University of Quebec historian Roman Serbyn, who in the introduction to a 2008 essay referred to estimates ranging from three to 10 million. But attempts to reach Serbyn were unsuccessful. Yale University historian Timothy Snyder said most "scholarly estimates" range from 2.5 to four million. He estimates that 3.3 million ethnic Ukrainians died in the entire Soviet Union during the 1932-33 famine. Snyder, author of the newly published book Bloodlands: Europe between Hitler and Stalin, said he found Harper's estimate "surprising" given that a January report commissioned by the previous Ukrainian government concluded there were 3.9 million deaths. University of Alberta historian John-Paul Himka wrote in a 2008 academic journal that the 10 million figure is arrived at only by including the children who would have been born if not for the famine. The true victims of Soviet dictator Josef Stalin's brutal policies, should be "unsullied by falsehood" and inflated figures not be used as a "political tool," Himka argued. "I find it disrespectful to the dead that people use their deaths in a ploy to gain the moral capital of victimhood. To this end, they inflate the numbers."